I saw the movie first and then read the book.... although I liked the movie a lot, the book was just beautiful. So sad and beautiful. Now here's a book I haven't talked about in FOREVER!! I read this maybe 6 or 7 years ago, but it was one of those powerful YA books. I remember being SO mad at what the M/C has to go through because of her "reputation". Instant E. Lockhart fan from the first chapter of this book!! Ruby Oliver is SO my girl. I love her voice, I love her humor, I love her lists, and I love her crazy. Zombies!! This book features zombies like I've never seen them featured... as a backdrop and not necessarily the main thing going on. I didn't quite "get" Sloane (I don't really think I was supposed to), but she became very memorable to me. What a sweet, cute, perfectly written YA Contemporary!! I will always read everything that Ms. Fitzpatrick writes forever ever because of the way her books come to life for me. Twenty Boy Summer was the first Sarah Ockler that I read, but THIS book was the one that solidified my love for her work. This book had everything- family issues, money probs., secrets, romance, friend problems, adorable little brothers-- Mr. Napkins 4ever!! Lauren Strasnick is one of those super-secret authors that I wish was more well-known. She's super talented at telling stories about girls that don't (and won't) fit into anyone's expectations. This series is so good and I hope it continues on!! I love Rose. I love that sometimes she can't control her anger, I love that sometimes she overshares and ends up looking ridiculous most of the time, I love that this book has a strong family storyline (no absentee parent in this book). I only wish that more people would give these books a shot. And that I could find more books that make me feel the way this one did. I haven't talked about this one in quite a while. It's one of the oddest, yet addicting books I've read. I loved the characters and the setting and the feeling of this book. This book was a super-surprise for me because the subject matter should have immediately turned me off. The ages of the couple alone should have made me close this book. I didn't close the book though. I could not put it down. I laughed and cried and felt so many emotions. I would definitely want to read more from this author. These are some of my well-loved books that I haven't talked about longer than I would like. I love finding great backlisted books, so I can't wait to see which books you guys have on your lists! Nice picks for this week! I haven't read any of the books on your list... I'll have to expand my reading horizons!! I loved The Time Traveler's Wife! 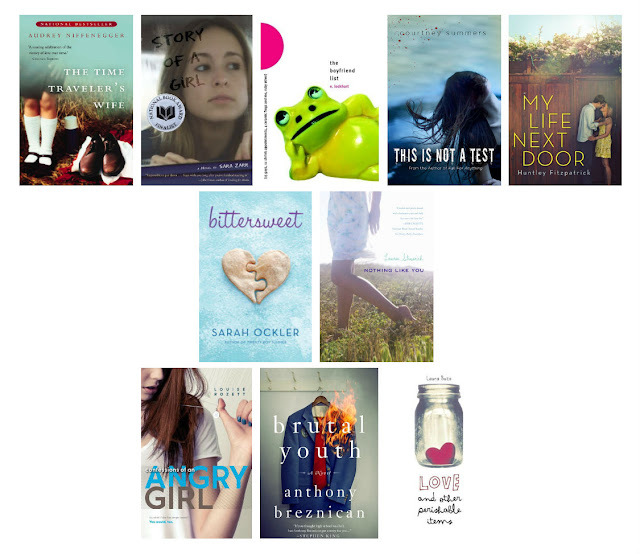 You have a bunch others that are on my TBR - Brutal Youth, My Life Next Door and Bittersweet. Great list!! This Is Not A Test sounds really good, and I recognized the name Courtney Summers I think because of her latest book. Haven't heard of this one but it sounds fun! My Life Next Door has been on my TBR for awhile. Lots of people rave about it! I've been meaning to read This Is Not A Test for the longest time! Great list! Great picks - Sara Zarr and Courtney Summers are two of my auto-buy authors! Some interesting picks up there. I have read a great many of them, but I still haven't gotten around to The Boy Next Door. I would have to include Grafitti Moon to your list and Me, Earl and the Dying Girl. I saw Brutal Youth when it was first released and then forgot all about it. You make me want to grab a copy - maybe I will check out the library! Great list. Yay, you so should!! I loved how different that book was. I loooved The Time Traveler's Wife. Love love loved. It's so heartbreaking and tragic and beautiful, and I can still remember where I was when I read it and how I felt. It's one of those books I'd like to reread but I'm not sure if I ever could. I did like the movie, I thought it did a pretty good job and the cast was wonderful. I really enjoyed This Is Not a Test too. I really need to reread it and review it on the blog. Nice list! Fantastic list Michelle. I need to read some more of these authors. This is Not a Test is fantastic!! The rest of these are new to me though, so thanks for sharing! 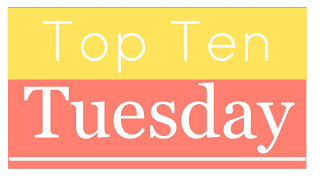 Here are my Top Ten! AHhhh I love My Life Next Door too!!! I never talk about it enough....but adfjadlks it's gorgeous and cute and SO SHIPPABLE. ;D And I'm really hard to please when it comes to contemporaries too, but that one was like top marks!! Thanks for stopping by @ Paper Fury! I liked Confessions of an Angry Girl and Love and Other Perishable Items too! Nice list! I remember when Brutal Youth cme out - it looked very intriguing but I'd kind of forgotten about it. Thanks for the reminder! The Time Traveler's Wife is a lovely book but I haven't seen the movie. I can't imagine the book translating well to movie so it's good to hear that it's pretty good if not quite as good as the book. Happy reading!